The only question is when clean energy will fully power the country, no longer ‘if.’ And the loud and clear answer we’re pushing forward is: Now. President Trump and the fossil fuel cronies he’s put at the helm of U.S. government are determined to wage an all-out assault on clean energy and climate solutions. They want to dismantle the U.S. Environmental Protection Agency, gut commonsense pollution protections, and fast-track fossil fuel projects like the Dakota Access Pipeline and Keystone XL. And they’re waging this assault at a time when the science couldn’t be clearer that we need to do the exact opposite: accelerate an all-out transition to 100 percent clean energy. The challenge before us is awesome, but the path to a clean energy transformation is rapidly emerging, and we can all play a role in clearing that path in time to limit temperature rise and guarantee our future. Earthjustice and our partners and allies around the country are applying the full force of the law and harnessing people power to advance clean energy solutions even as we resist efforts to roll back progress by an unprecedentedly hostile administration and Congress. States can and will lead the way—and we’re pushing them at every step. Much of our nation’s energy policy is crafted at the state level by public utility commissions. Utility commissioners decide whether customers like you will be forced to pay for power from a dirty coal plant, or benefit from money-saving energy efficiency programs, or generate your own electricity affordably with rooftop solar. Earthjustice attorneys, in partnership with state and regional partners, are crisscrossing the country making the case for clean energy in these often overlooked but immensely important regulatory forums. In this venue, good lawyers—and customers like you—can make an outsized impact. Shannon Fisk, Managing Attorney at Earthjustice, during proceedings in Ohio to fight proposals by utilities that could cost customers billions of dollars, while guaranteeing profits for corporate shareholders. The market momentum of clean energy is on our side—and likely unstoppable. For power companies, it’s getting harder and harder to justify continued investments in fossil fuels when clean energy solutions are available, affordable and scalable now. Utility-scale wind and solar power are now cheaper per kilowatt-hour than gas, coal, or oil. The solar industry created 1 in 50 new U.S. jobs in 2016. As the costs of clean energy plummet, wind and solar are taking off at a record pace, with the jobs to match. The solar industry created 1 in 50 new U.S. jobs in 2016. Wind turbine service technician is now the fastest-growing occupation in the country. Nationwide, clean energy now employs more people than fossil fuels. And, globally, the world saw a record level of renewable energy installed in 2016. President Trump and his fossil fuel allies may try to slow this momentum, but they can’t stop it. At the same time, we’re working to make sure affordable renewable energy is widely accessible. 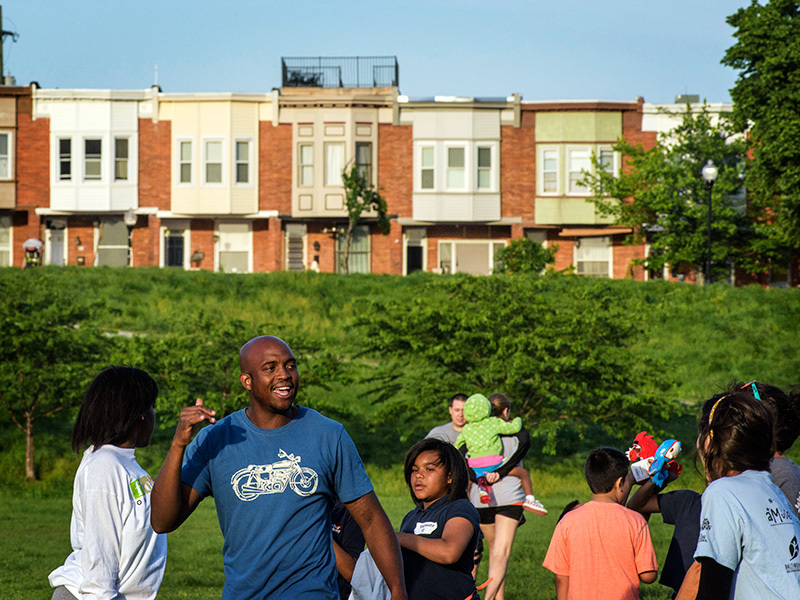 For instance, in Maryland and elsewhere Earthjustice is working with local partners on innovative community solar projects that make rooftop solar accessible to people who rent, live in apartments, or otherwise don’t have a suitable rooftop of their own. Maryland's new community solar legislation may benefit many, including Baltimore's Paterson Park neighborhood. People want change—and our movement is gaining power. 75% of Americans, including 6 in 10 Trump voters, support regulating climate pollution. 82% of Americans, including 7 in 10 Trump voters, want to fund renewable energy research. 2/3 of Americans support renewable energy requirements for utility companies. Public concern about climate change is at the highest point in three decades, and big majorities of Americans want to see action. Our challenge is to channel this broad support into bold action. But we’re not starting from scratch. In communities across the country, people have been building power to challenge fossil fuel companies and plant the roots of a brighter future. Earthjustice has been proud to fight alongside communities from Dryden, New York, to Oakland, California, to Standing Rock, North Dakota, to ban fracking, halt coal exports, and fight pipelines. The resistance to fossil projects are growing everywhere—in creative, persistent, and powerful ways. Watch: The Town That Changed The Fracking Game. Dryden's fight reached New York State's highest court—and set a statewide precedent upholding the rights of local communities to use their zoning powers to ban or limit fracking. “This fight is about justice and sovereignty. And it’s not over,” said Jan Hasselman, attorney at Earthjustice. He is lead counsel to the Standing Rock Sioux Tribe in their fight against the Dakota Access pipeline. Our clean energy lawyers are on the frontlines. 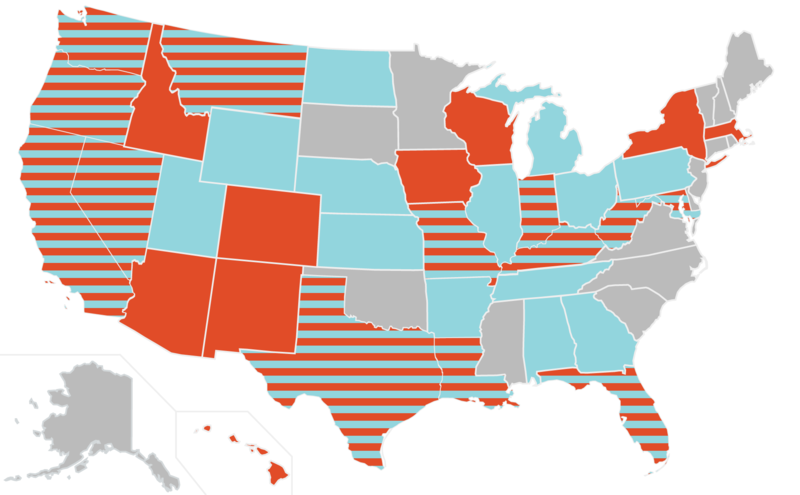 In a growing number of states, Earthjustice is championing and defending clean energy progress. Accelerating solutions: In states like New York, California, Hawaiʻi, and Maryland, we’re scaling up forward-thinking solutions that enable clean energy to thrive and expand access to it, from modernizing our electric grid to piloting community solar projects to expanding energy storage. Shifting from fossil to clean: From Louisiana to Ohio to Kentucky, we’re exposing the true costs of dirty coal- and gas-fired power plants, driving many to retire, halting expensive customer-funded retrofits, and clearing the way for solar and wind power to take hold. Beating back attacks: From Nevada to Arizona to Florida, we’re facing off with utility companies and well-funded fossil fuel interests to protect progressive policies from their attacks, fighting for customers’ rights to put solar on their roofs, for fair electric rates, and for a level playing field for clean energy. Make Climate & Clean Energy Part of the Conversation. 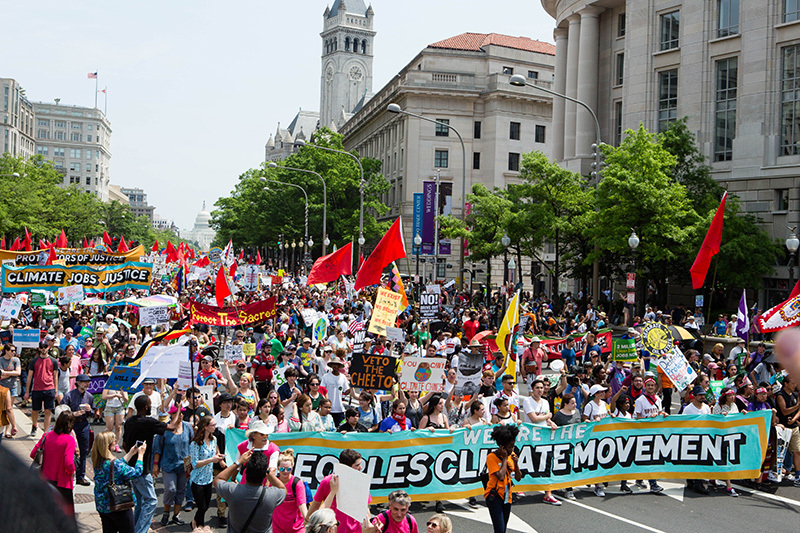 Earthjustice was proud to join The Peoples Climate Movement for the March for Jobs, Justice and the Climate in Washington, D.C. 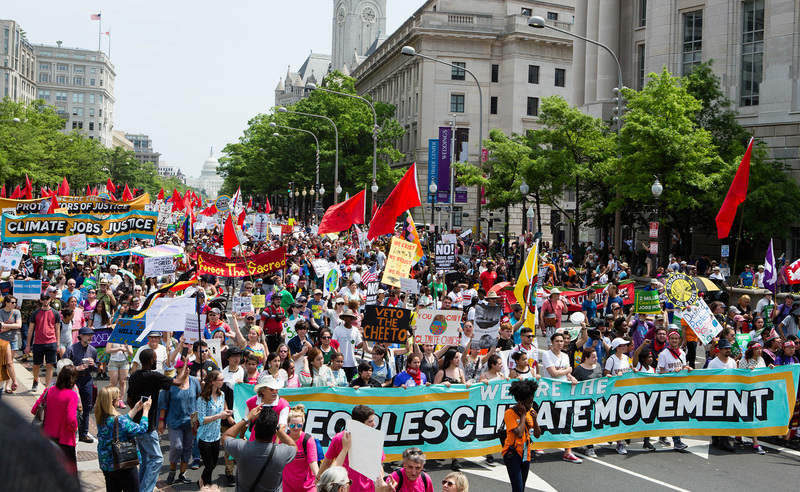 The march was a resounding and impressive assembly of people mobilized for climate progress. Read just a few of the reasons why people marched, learn about issues such as the Paris Agreement, and share your reasons for supporting climate progress with your friends and family. Have time? Volunteer with our network of state-based clients. 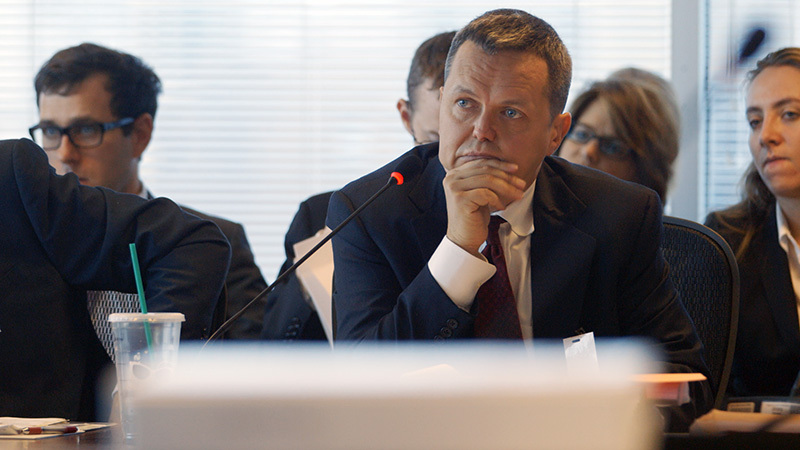 Find out when your state utility commission meets. Join a local fight against a fossil fuel infrastructure project. Have funds? Help fund our attorneys who stand arm in arm on the frontlines with community groups fighting fossil fuel projects and pushing for accessible clean energy for all. Have friends? Spread the word! Image credits The Peoples Climate Movement for the March for Jobs, Justice and the Climate in Washington, D.C., April 29, 2017, by Chris Jordan-Bloch / Earthjustice.